Mitch Epstein, Warehouse, 2000. C-print. Image courtesy of the Progressive Corporation. "Work hard=Do well. This project asks, when and how did that equation fail-for him, but also for a whole country of American Dreamers?" 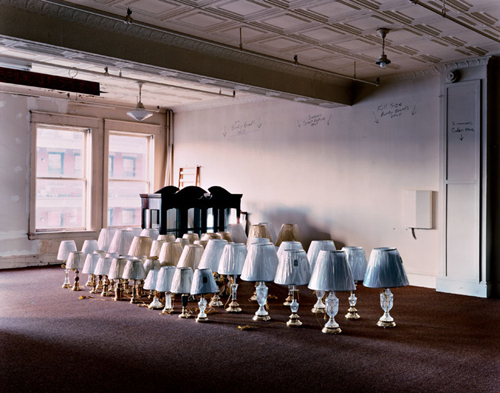 Family Business is a film and photographic project about Mitch Epstein's father and the demise of the family furniture store. Two of Epstein's photographs are currently on view in A Family Affair, an outstanding selection of works from the Progressive Corporation's contemporary art collection that encompasses a variety of media, all embracing the theme of family. "I was 48 and living in New York when my mother called me about the fire. On a windy August night in 1999, two 12 year old boys had broken into a boarded up apartment building owned by my father in Holyoke Massachusetts and, for the hell of it, set it ablaze. The fire had spread, engulfing a 19th century Catholic church, then a city block. The 15 million dollar lawsuit the church brought against him threatened to unravel my father's life. He had insufficient liability insurance. If he lost, my parents would be, in effect, after 50 years of a comfortable suburban life together, out on the street. I had left Holyoke at 18 and gone home in the intervening years only for holiday dinners. Faced with the family crisis, I went back to help, but there was little I could do. I became possessed, however, by one simple question: how had my father, once owner of the largest furniture and appliance store in western New England and former Chamber of Commerce Businessman of the Year in 1974, ended up a character out of an Arthur Miller tragedy? 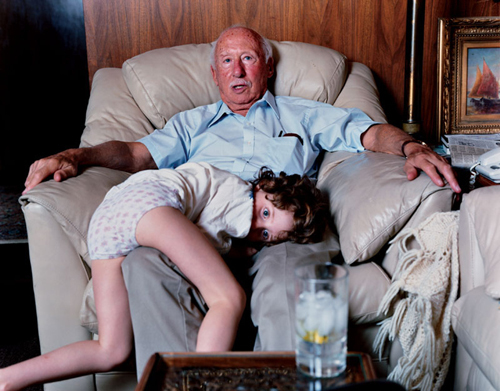 Mitch Epstein, My Dad And My Daughter, Lucia, 2002. C print. Image courtesy of the Progressive Corporation. The fire prompted me to make a series of large format photographs and a video installation about my father's life to better understand the path he had traveled. Crucial to his story is that of Holyoke itself. The commercial center died in the 70s, its customers gone to the new supermall. Holyoke became a crack-riddled, arson-wrought town. A recent wave of immigrants turned the formerly "white" downtown Hispanic. The culture clash resonates in the relationship between my Jewish American father and his Puerto Rican tenants and employees. My father and his generation of men were and still are driven to fulfill an American Dream that had its epiphany in the fifties: Work hard=Do well. This project asks, when and how did that equation fail-for him, but also for a whole country of American Dreamers?"